The years 1844-7 are often described as the years of 'Railway Mania', signifying an unprecedented period of railway investment and construction over the whole of the UK. It was a period of economic prosperity in Britain, and long-distance railways were required to further trade. Every town wanted a railway station. Miller's output at the time was extraordinary — in November 1845 alone he submitted to Parliament proposals for more than 2,400km of railway. This was lucrative work, for even if the proposals never came to fruition, he charged four or five guineas per day for each project, roughly equivalent to �0-�0 per day in 2010. Some engineers charged even more: Robert Stephenson's daily rate was �.50. Miller was often in London working on proposals or overseeing Parliamentary Bills. He had an office at 2 Parliament Street in Westminster, in addition to his Edinburgh premises and the Millfield estate in Stirlingshire. His ever-growing workload meant he couldn't oversee every detail of all the projects and he delegated to a team of assistants and resident engineers. In some instances, Miller was blamed for entrusting work to engineers with insufficient experience to ensure competent construction, and his reputation did suffer. His practice was staffed by a group of young men who went on to become established railway engineers. They included Charles Jopp (1820-95), who worked as an apprentice from 1841-7 and later as chief assistant; apprentice and later senior assistant Benjamin Hall Blyth (1819-66); assistant George Cunningham (1829-97); engineer David Bell and apprentice James Fairlie Blair (1831-76). Cunningham was to have a long association with the Miller family and would marry Miller's eldest daughter Margaret in 1858. 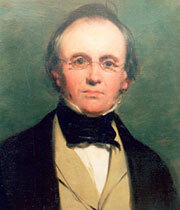 From 1842-9, Miller was Engineer for the North British Railway — the first Scottish railway to reach the English border. North British would eventually own more kilometres of track than any other railway company in Scotland. Its enabling Act of Parliament was passed on 4th July 1844. Both the 92.5km main line from Edinburgh to Berwick upon Tweed in Northumberland, and a 7.2km long branch in East Lothian, from Longniddry to Haddington, opened on 18th June 1846. As often happened on large railway schemes, Miller's work for the North British was checked by another railway engineer, in this case Robert Stephenson. The route included some steeper gradients than Miller had used before and all its significant structures were specified in ashlar masonry — bridges, tunnels and viaducts, including the largest structure, the Dunglass Viaduct. However, construction was beset by pay strikes and unrest between the gangs of navvies from the Scottish Highlands and Ireland. Inadequate supervision by contractors and resident engineers added to the problems, and poor workmanship was frequently the result. Criticism began soon after opening — flooding in September 1846 caused widespread damage to a long section of line that included East Linton Bridge in East Lothian, which had to be repaired using a timber structure replacing the two central masonry spans. On 21st July 1845, the North British merged with the Edinburgh & Dalkeith Railway (built 1827-31) and took over the planned route for a railway between Edinburgh and Hawick in the Scottish Borders. This was later renamed the Waverley Line as a tribute to Sir Water Scott (1771-1832), whose novel Waverley was published in 1814. The line opened in sections between 1847 and November 1849. The North British added a branch at Musselburgh in East Lothian in 1847, and a route hugging the Scottish border from Berwick to Kelso was also constructed (1846-50). The latter was connected to the Waverley Line (1849-50) by a line from Newtown (now St Boswells) to Kelso. It included the Roxburgh (Teviot) Viaduct, part of which collapsed during construction killing eight people. On 5th October 1849, Miller was described as being "desirous of resigning active charge of the company's business and hereafter if the directors should desire it to act only as their consulting engineer". Jopp and Miller's nephew John Miller junior (born 1827, son of his elder brother James) were duly appointed Engineers to the North British in December 1849, a post later occupied by erstwhile Resident Engineer James Bell (1808-85). Union with England's east coast railways was achieved when the North British joined with the York, Newcastle & Berwick Railway after Queen Victoria opened Stephenson's Royal Border Bridge on 29th August 1850. This event marked the establishment of a route all the way from Edinburgh to London. From 1845, Miller was working in some capacity on the Dundee & Perth Railway, though not its construction. The railway opened on 22nd May 1847. In 1846 it had leased the Dundee & Newtyle Railway, built 1826-32 under engineer Charles Landale (1764-1834), and in 1848 it leased Miller's Dundee & Arbroath Railway (built 1836-8), subsequently changing its name to the Dundee & Perth & Aberdeen Junction Railway. The year 1845 was especially busy for Miller, and he was appointed Engineer to the proposed Direct Northern Railway, one of several contenders for a London to York line — 'direct' because the route via Lincoln was 283km long and the as-the-crow-flies distance between St Paul抯 Cathedral and York Minster is just over 280km. In 1846, the Direct Northern and the London & York Railway amalgamated to become the Great Northern Railway, with Miller as Engineer for the building of the northern half, though he later resigned. He also worked on at least 18 other schemes that were never constructed. Also in 1845, he became involved with the Stirlingshire Midland Junction Railway, which received Royal Assent the following year. It formed a link from the Edinburgh & Glasgow Railway at Polmont eastwards to Larbert and Carmuirs on the Scottish Central Railway (built 1845-8). Miller constructed a swing bridge at Grahamston to carry the Stirlingshire Midland Junction over the Forth & Clyde Canal but by the time the line opened on 1st October 1850, he had left the company. Meanwhile, disputes were raging between competing factions for a trans-border west coast main line. Eventually two railways won the right to cross the border into England at Gretna. They were the Caledonian Railway (built 1845-8) and the Glasgow, Dumfries & Carlisle Railway, of which Miller was the Engineer from 1846 to August 1849, and acted as a consultant thereafter. He was now responsible for all the through main lines in southern Scotland except the Caledonian. The Glasgow, Dumfries & Carlisle dates from March 1844. Its enabling Act of Parliament was passed on 16th July 1846 and construction started in 1847. The route began at Cumnock and ended at Gretna Junction — its trains used the Caledonian Railway tracks between Gretna and Carlisle. The line opened on 28th October 1850 and includes the 1.28km long Drumlanrig Tunnel, constructed to conceal the railway as it crossed the estate of Walter Francis Montagu Douglas Scott (1806-84), fifth Duke of Buccleuch. The newly opened Glasgow, Dumfries & Carlisle merged immediately with the adjoining Glasgow, Paisley, Kilmarnock & Ayr to form the Glasgow & South Western Railway. This was another railway on which Miller's nephew also worked. Its most impressive structure is the 14-arch Lugar Water Viaduct that Miller himself considered to be his greatest work. All these projects were affected to some extent by the collapse of Railway Mania into the economic depression of 1847-8. Inevitably, the booming prices of railway shares were unsustainable in the long term and schemes were closed to investors. This tended to delay the completion of lines already under construction, and may have influenced Miller's decision to retire. Although only 43 years old, he was already thinking about retirement by 1849, and he withdrew from the North British Railway in December that year. He had been working at an incredible pace since the 1830s. During 1850, he ended his work commitments with many of the railway companies, and this was the year he chose for his retirement, though he continued with some railway engineering until 1851. 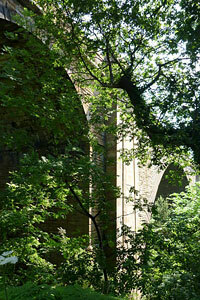 The largest structure on the North British Railway — Dunglass Viaduct. 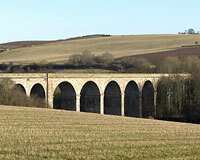 Roxburgh (Teviot) Viaduct was constructed as part of the Musselburgh branch of the North British Railway (1847). Unfortunately, part of it collapsed during the works, killing eight people.